At Camp Broadway®, you will have an authentic, enlightening and joyous theatre arts experience taught by trained Broadway professionals. Inspired by Broadway’s cherished works and steeped in its grand traditions, every program is designed to build confidence, inspire creative expression, and instill well-being in both aspiring artists and future audiences. As such, our programming is presented in a positive, respectful and safe environment. “Character” is a defining principle with equal relevance both on and off the stage. Studies have shown that one’s social, emotional, ethical and creative skills are the building blocks to the development of “Character.” Over the last 15 years, nearly 80 percent of funding for social studies and arts-based curriculum which influences positive character development has been eliminated from schools. 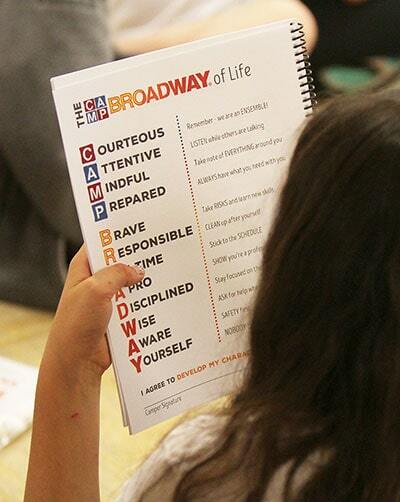 Camp Broadway’s programs adhere to the belief that engagement in the theatre is an effective strategy in helping parents and educators teach their children about becoming responsible, ethical people. Camp Broadway enables our “Cast of Characters” to immerse themselves in musical theatre and drama as a way to study real and fictitious characters whose stories are told through dialogue, song and dance. In the process, they learn the necessary skills to perform successfully at every stage of life. Camp Broadway’s culture is collaborative, trustworthy and service-focused. The management team, creative staff and training faculty are experienced, knowledgeable professionals who have worked in all aspects of the legitimate theatre—on stage, backstage and in producing or production offices. As stewards of Broadway’s distinguished creators, and teachers of its masterworks, Camp Broadway’s staff is committed to maintaining and teaching the highest professional standards for authenticity, artistic integrity, and attribution of authorship. To have fun through creative collaboration with others. To make friends that can last a lifetime. To gain self-awareness and find a creative voice. To acquire life skills needed in every field of endeavor. To learn from accomplished artists and theatre professionals. To be exposed to a wide variety of careers in the creative arts industry. To become an informed patron of arts and culture.